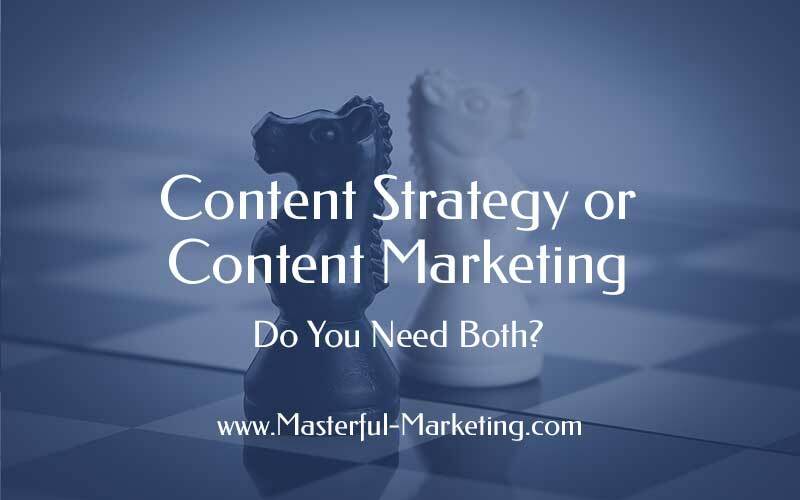 Content Strategy or Content Marketing - Do You Need Both? Before diving into creating content, you need a content strategy. And your content strategy is needed before you can implement a content marketing strategy. Content strategy is the blueprint for what content your business needs in order to accomplish your business goals. Your content strategy includes what content you plan to create, what format you will use, who will create it and the style to be used across all media channels to project a consistent brand image. Your content strategy is there to ensure consistency across all ofyour content including presentations, email newsletters, blog posts, white papers videos, podcasts or whatever type of content you are creating. Content marketing is a marketing strategy that defines how you will take that content and make it visible to attract a clearly defined target audience and convert them into leads and ultimately into customers. If you want to do content marketing, you need a content strategy. There are many content strategy templates – some more complex than others. Since I like simplicity, especially for small businesses, here is my take on what you need to know to develop your content strategy for your business. However, content to drive inbound leads would be different than content to gain increased visibility. You may need a detailed e-book as a lead generator but quality blog posts shared on social media can increase your visibility. What challenges do your clients face? What content can you create that will help them find you when they are doing research looking for solutions. This is your opportunity to become reliable source of information that keeps them coming back for more. Writing requires creative thinking. Know what it will take for you to deliver the content you need for your campaigns and commit to no more than you can consistently deliver. If you are going to go it alone and can remain consistent in your delivery, great. If you know you need help, find someone who can help you create the content you need and manage its life cycle so you can work on your business and continue to grow. If more than one person is creating the content, especially if you are outsourcing content creation, you need to document your brand in a style guide. A style guide defines and enforces your brand in terms of colors, fonts, logo usage and other design criteria so that all content produced is branded consistently. Once you have your content strategy in place, you can now create a content marketing strategy that will form the basis of your inbound marketing efforts. You need to define how you will use that content to attract quality leads and convert them into customers. Your content marketing strategy is a road map for how you will use content to meet your marketing goals. What are the goals of your content marketing efforts? As mentioned above, different goals require different content. 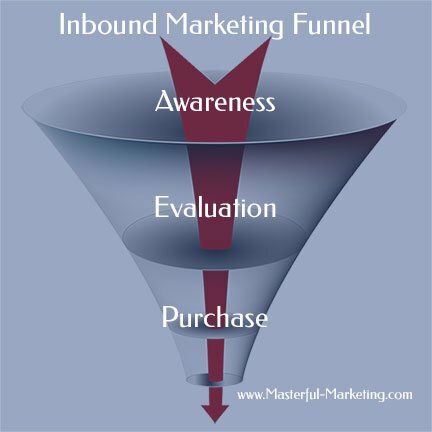 A buyer is on a journey and the content you provide differs for each phase of the inbound marketing journey. Early in the journey, the buyer will be looking for awareness and education on a solution. This is where your blog posts and social media will play an important role. Next the buyer will want to know more about your solutions. At this point, they will benefit from webinars, case studies and other more in-depth content. Finally the buyer will want to purchase if your solution makes sense. This is where you need to be creative depending on your industry. A free estimate, a demo, a free trial or a complimentary assessment will help the buyer finalize their decision. Content is not just words. It can be video, audio, images and text. The type of content you use will depend on your target audience and the goal of the content. Develop a good mix of content types that makes your content interesting and easy to consume. Also take content in one format and re-purpose it into another type that enables distribution on a different platform. For example, take a blog post and turn it into a presentation. That presentation can then be distributed on Slideshare. Then record the presentation and share on YouTube. Content without distribution and sharing is content that is invisible. You need to cast a wider presence by getting your content out to where your target audience is spending time. Align your content distribution with the buyer journey, paying for advertising where necessary to reach your ideal audience. Creating a robust editorial calendar that outlines content, purpose, timing, type, keywords, call to action and distribution strategy for each piece of content will help you know what you need to do to stay on track. Your editorial calendar can be shared with outsourced content creators to help them deliver their content on time. Notice how content strategy flows into your content marketing strategy. As the foundation of your content marketing strategy, your content strategy plays an important role in helping your business implement a successful inbound marketing campaign. Just remember that both your content strategy and content marketing strategies should be living documents that evolve to meet the needs of your target audience. But this doesn’t need to be a complicated exercise. Spend an hour or two to put the strategy in place and create a rolling 90 day editorial calendar to give you the ability to respond to opportunities and changes in the market. Note: There’s an editorial calendar included with my free marketing campaign template. Content marketing is the best and most unique way to get quality links and better traffic.